Many companies are unaware that forklift driver training is required by even an occasional operator. The time to learn this fact is not after an accident when OSHA comes in and asks to review your employee records. The training must be specific to the type of forklift in operation. Therefore, a license for a sit down rider type forklift will not suffice for a narrow aisle standup reach truck operation. Our training includes a video explaining the finer points of operation and explanation of the physics of how a forklift works; followed by classroom discussionand written test. The trainees are required to perform certain maneuvers in an obstacle course to show that they have the skills needed for the safe operation of the equipment and the product being handled. Once a trainee has shown these skills and has a passing grade on the written exam, a wallet size card is issued. There is also a letter and certificate of completion mailed for the company's employee file. We recommend a refresher course every two years. Please call us for more information and pricing on this valuable service which is normally performed at the company site. 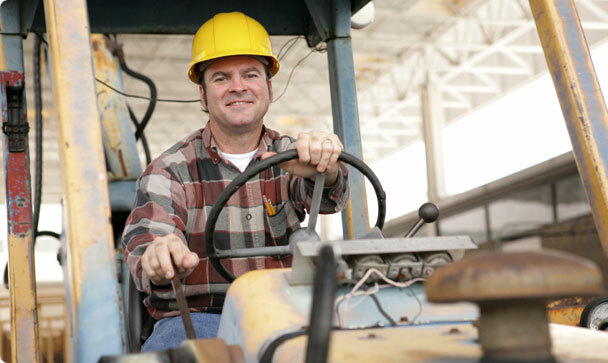 Forklift Operators must be fully trained and employer-certified as required by the Federal OSHA standard 1910.178. As part of the regulations, lift truck and forklift operators are required to complete formal classroom training, practical hands-on training and an evaluation. Employers need an effective and comprehensive training program to meet this OSHA regulation. This course is designed to fulfill OSHA's requirement that "only trained and authorized operators shall be permitted to operate powered industrial trucks." This training program is applicable for Electric, LPG, Gasoline, or Diesel operated powered industrial trucks. Trainees must pass a written test and an operator performance evaluation test. OSHA requires a written test with pass/fail standards. NOTE: Within 5 business days upon successfully completing a training program, the trainee will receive a Certificates of Achievement, an achievement letter for their personnel file and a wallet size operator's license.